Becoming Italian.....: Truffles from Alba! I would like to go on record to declare that the intoxicating smell of truffles might possibly be my all time favorite smell. Every time the pungent and earthy aromas fill the air, I immediately have a huge smile upon my face. 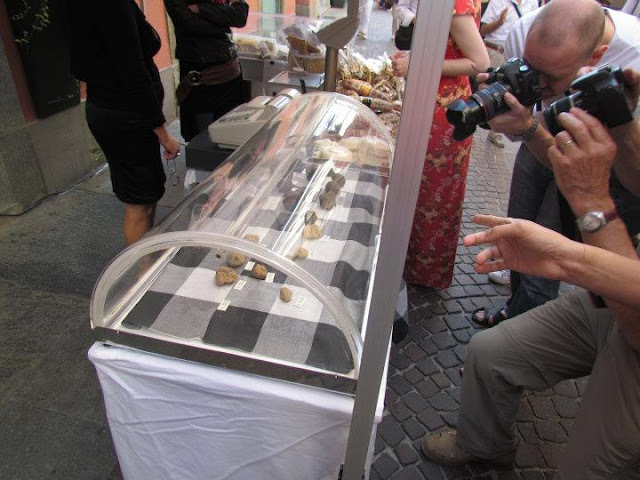 For the last month, every weekend I would visit the farmers market in the medieval town of Alba, which is home to the Fiera del Tartufo, or the Alba truffle fair. Last week HD and I decided to visit the event that attracts thousands of people from around the world. It was a treat to walk around and feel the buzz and excitement from the buyers that were touring the pavilion and visiting vendors who are peddling their latest hunted truffles. The harvest begins in September until December in the picturesque hills of the Langhe. The grow underground next to oak trees and are found by specially trained dogs in the middle of the night. Truffles or tuber magnatum pico (its scientific name) are one of the most expensive foods on earth. On average expect to pay around $4,800 per kilo. Lucky for us, we are in Piedmont because the best and most expensive truffles in the world are found here. White truffles have a very short shelf life, and must be consumed within 1 week of being hunted. White Truffles typically lose up to around 5% of their body weight every day. The largest truffle in the world weighed 1.31 kilograms (2 lb 14 oz) and has entered the Guiness Book of Records weighing the most for a truffle ever found. The white truffle is far more superior to the less prestigious black truffle. In fact white truffles must never be cooked, but consumed raw. It is best shaved paper-thin over simple dishes like plin with butter and sage, scrabbled eggs, or a simple risotto. Here are a few ways I have had the pleasure to enjoy truffles this past week. Poached Potato cream with lapsang souchone (adds a smokiness quality), poached egg yolk, and black Alba truffles. Enjoyed at Ristorante Piazza Duomo in Alba. 'Agnolotti al Plin' filled with Veal served with a sauce of butter and sage finished with white truffle. Enjoyed at The Enoteca at Marchesi di Barolo. Black truffle wafer with chocolate cream served with truffle gelato and hazelnuts. Enjoyed at Ristorante Piazza Duomo in Alba.